The English golf club which was the scene of one of his most famous shots has paid tribute to golfing great Seve Ballesteros, who died this week. Flags were lowered and a minute's silence observed by staff and golfers at The Belfry Club in Warwickshire. 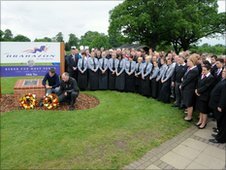 As his funeral began in Spain, hundreds gathered at the plaque marking the spot on The Brabazon Course's 10th tee. "Seve made the course world-famous with that one shot" said director of golf Gary Silcock. In 1978, playing in the Hennessey Cup, the bucaneering Spaniard became the first player to drive the 311 yards over water and trees to the tenth green. Ballesteros also represented Europe at Ryder Cup contests which were held at the Belfry in 1985, 1989 and 1993. "It was very moving to see everyone from golf professionals to caterers observing the silence on the hole where Seve first drove the green in 1978 against Nick Faldo and again in 1985 when he helped Europe regain the Ryder Cup here," said Silcock. The Belfry has also welcomed visitors wishing to pay their respects by laying wreaths alongside the plaque.